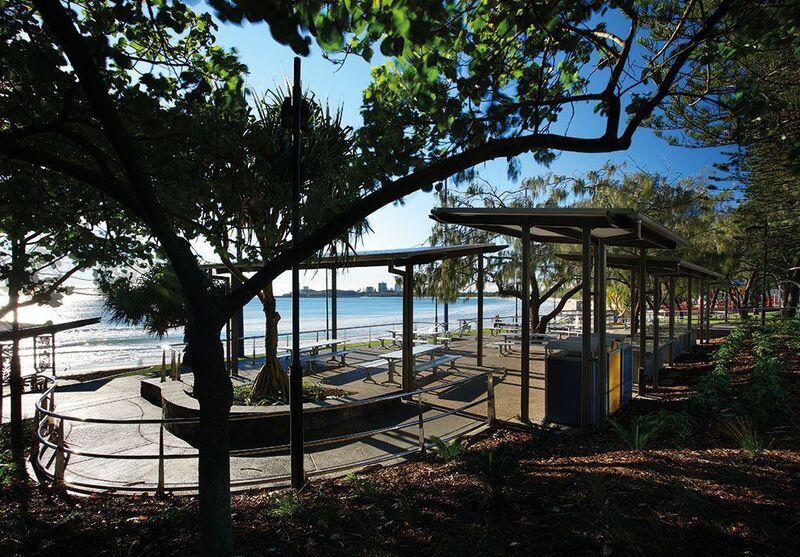 Following a successful Design Development stage Place Design Group was commissioned to produce construction documentation for the redevelopment of Mooloolaba Esplanade Stage 2A. This beachfront location adjacent to the popular Mooloolaba Surf Club is a compact foreshore park which experiences concentrated use and demand by residents and visitors alike. The brief was to provide an innovative, creative and functional design in keeping with the established strategic direction and vision for the area. The design needed to capture the essence of Mooloolaba style which required the sensitive manipulation of existing levels and the integration of established trees. Coastal She-Oak, Pandanus and Norfolk Pines were retained as essential character and shade elements throughout the parkland. The final design required flexibility to find a balance between different uses and their space requirements, including pathways, BBQ areas, lawns, tables, beach access, beach showers and seating coupled with the discrete space available, added to the overall complexity of the project.